I'm not a crazy bag hoarder, but I love these bags! There's just something so rustic and yet feminine about these little beauties. I'm consiering changing my baby bag for this little boy to a new handy rucksack! Wish me luck in my quest! 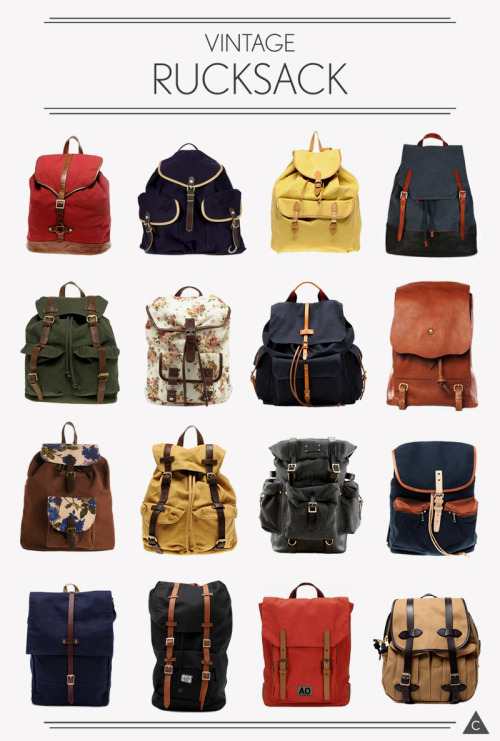 I've been wanting a rucksack so bad!! love that you posted about this! i'm so happy you found my blog because i really do love yours! funny enough, i'm off on a trip soon & i think a rucksack would be perfect for the day trips! great minds think alike! THank you Leslie! And Aislin you're right! I would love these for trips! THats a fantastic idea! thank you so much for your support! Great idea for a baby bag. My fave is the bottom right. I love all of them! I think my favorite is the second one on the fist row! these are so cute! i love the ruksack look. i hope you are able to find how you can purchase them! wow christine lucky! That floral one is one of my favorites! THanks Meghan! I'll let you know! The last two are my favorites! I haven't seen these around much, but now I'll have to go looking. Lovely!